Machine Shop :: Five Star Associates, Inc.
We provide CNC Machine Shop Services for Milling using our Haas TM-1P CNC Mill and Turning using our Haas SL-20 CNC Lathe. Most of what we machine is aircraft grade 6061 and 2024 aluminum. 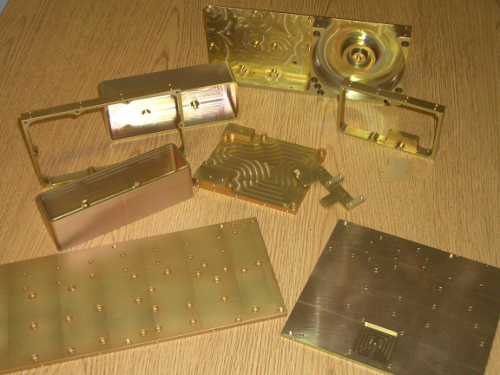 We also Machine Brass, Stainless Steel, and some Plastics. The TM-1P is fitted with CAT-40 tooling, Enclosed Coolant System and Ridged Tapping. The SL-20 Lathe was aquired in December of 2013. It has Live Tooling, Full C-Axis Drive, A Tool Presetter and High Pressure Coolant System. The Live Tooling function is unique in that it allows us to do milling on the lathe. We have lots of other equipment as well. Check out our Equipment List for more detail.